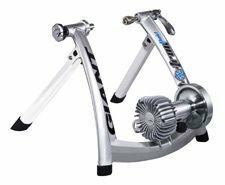 This quiet yet stable trainer, will help you keep up with training on those rainy or cold off days. Keep moving with the technical performance and advanced yet simple options offered by this superior trainer. Patent pending TurboTron(TM) roller - oversize 70mm diameter with precision-cut cooling scoops reduce temperatures, increase tire contact, reduce tire slip, increase tire life.